GE Warming Drawer keeps plates warm, ready and waiting to serve that special meal! The Hidden Temperature Control has low, medium and high settings as well as Proof - a setting that is ideal for the dough rising process, along with Infinite Setting Temperature Control (75 Degrees to 230 Degrees) and Variable Humidity Control (Crisp to Moist). GE wall ovens offer a true built-in appearance because the ovens are installed into surrounding cabinetry, which provides a custom look. This range features GE's TrueTemp system, which manages oven temperatures to ensure accurate, consistent heating and total cooking performance. The SmartLogic electronic control, with platinum sensor, constantly monitors the oven's performance to ensure more precise temperature management. The Hidden Bake oven interior hides the previously exposed bottom element to deliver a clean interior appearance. This 30-inch combination wall oven with Even-Heat true convection provides consistent heating and even cooking. A unique bow tie-shaped design and convection fan help ensure there are no burnt edges or undercooked centres. Its upper microwave convection cooking oven combines a 900 Watt microwave with a 1600 Watt convection element for high speed cooking. Bold design details are the perfect balance of elegance and functionality. Stainless Steel 30 In. 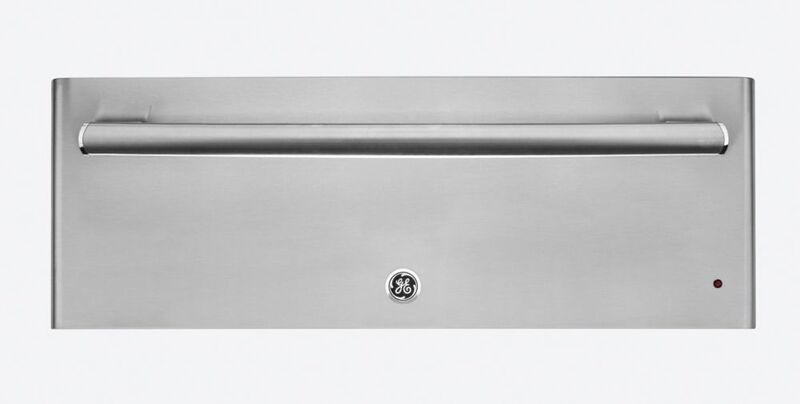 Warming Drawer - PW9000SFSS GE Warming Drawer keeps plates warm, ready and waiting to serve that special meal! The Hidden Temperature Control has low, medium and high settings as well as Proof - a setting that is ideal for the dough rising process, along with Infinite Setting Temperature Control (75 Degrees to 230 Degrees) and Variable Humidity Control (Crisp to Moist). Stainless Steel 30 In. Warming Drawer - PW9000SFSS is rated 4.6 out of 5 by 33. Rated 5 out of 5 by Nat3752 from Love it! Warming drawer is a fantastic addition to the kitchen! Especially if you’re not great at timing to have everything ready at the same time! Love this product! The light keeps me honest to make sure I turn it off - excellent product!! Rated 2 out of 5 by JiminDallas from Warming oven trips gfi breaker repeatedly Since owning this warming oven it trips my gfi after approx 5-10 mins. Happens at all settings (low to high). Other appliances in the same outlet/circuit do not trip the gfi. I had an electrician check gfi And wiring with no issue found. I’ve read some postings that warming drawers should not be on a gfi, but the GE installation manuals do not indicate this. Please help. Problem with the oven itself? Rated 5 out of 5 by Italycook from Convenient! Still getting used to having one, enjoy using. Does make a noise when it sits on for too long, but working on a reason for that. Rated 5 out of 5 by BKP01 from Great flexibility. Temperature options are great as well as the rack for layering and fitting more in the drawer. Rated 4 out of 5 by S2MPiglet from Great addition of my Appliance Inventory Really happy with the addition of the GE warming drawer, it's extended my ability to keep food and places warm without have to take up space in my oven. Rated 5 out of 5 by Brantberry from SO practical! Our builder suggested adding the warming drawer below our Profike oven & Advantium oven & we weren’t sure how much we’d use it, but have used it a ton & are grateful we have it. We use it while making big meals & trying to keep things warm as I finish the rest or to hold food warm for family that couldn’t eat with us until just a little later. And of course whenever we host big family dinners or have friends over, it helps keep everything warm without continuing to cook the food. We have been VERY happy with this added helper in our kitchen. Rated 5 out of 5 by Ausybarb from Very convenient Never had one before but love it so handy for keeping food warm. Instead of heating oven every time. Rated 5 out of 5 by Kleekel from So Far So Good I have been able to use this warming drawer several times since purchase. Very simple but very effective.